Last year I spent a considerable amount of time in my local library. A very nice library in Bollington. I led six workshops there for children for World Book Day. I led a creative writing workshop for Adult Learners’ Week. I presented awards to the children who’d completed the summer reading challenge. I set up camp there for a day with the Roaming Roman Book Tour. And since July have been running, every Tuesday evening, a writing group there. On February 27th I attended a talk given by a local chap who’d self published his memoirs. The book’s called From Bollington To Zanzibar and is mentioned in this blog. I think it’s important to support these kind of things and people. I was in the kitchen with my girlfriend earlier, flicking through my local rag. They covered this recent event and the article was in there (they’ve covered my events there as well). Needless to say this is wrong and I am incredibly cross. I’m not the sort of person who wants his picture in the paper. I’m quite shy. I get extremely frustrated though, when people don’t do their jobs properly. This is lazy reporting and shows a complete lack of professionalism, competence and care on the paper’s and the reporter’s parts. In any job I think there should be some kind of pride in doing it well. I feel especially strongly about it when it comes to the profession of writing – hardly surprising when that’s my profession. It deserves and demands respect. 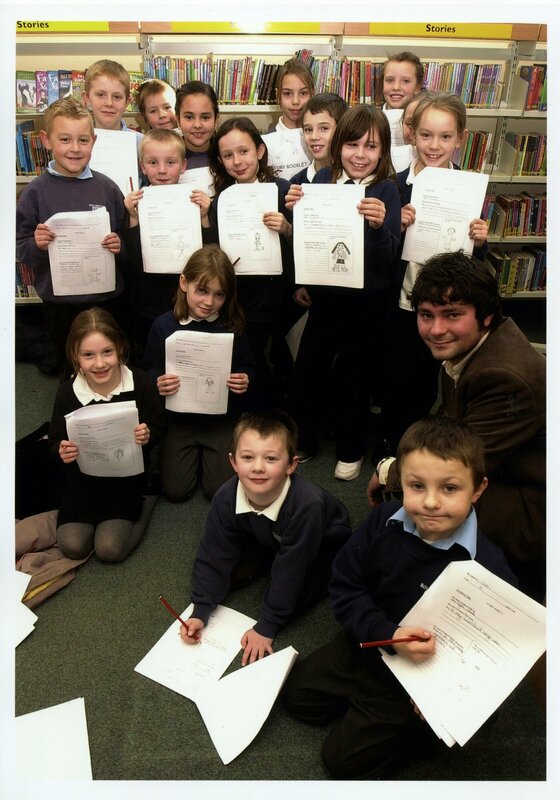 The above photo of me and a lovely class from Bollington Cross School was taken last World Book Day. I’ve included it as evidence. Nik, you are right to be furious. And you’re right when you say it’s down to shoddy, lazy reporting – basically someone who doesn’t care what goes in their paper.The problem is none of us writers can afford to make enemies of the local press, even if they are halfwits. You have to bring this mistake to their attention but you have to find a way to do it that swings the advantage round to you. Humour (which you may not be in the mood for right now) when correcting their mistake might be one way of doing it. They should, by rights, print a correction – and that could actually be good for you because it would draw attention to your name and book once more.Congratulations on completing the draft, by the way and thanks for the messages on my blog.Rog. Thanks Rog. I am calmer now, though still no good at writing humour! What are you so upset about? The book in question is well written, funny and everyone I know has read it thoroughly enjoyed it, and another thing it wasn’t self published …. Talk about lazy journalism, get your facts right! Green houses and stones come to mind.